NEW YORK - The Kingdom of the Netherlands will be a member of the United Nations Security Council as from January 1, 2018. 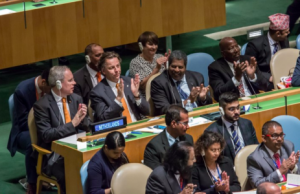 Minister Koenders of Foreign Affairs was present in New York today at the UN General Assembly, where the vote took place. The Kingdom, which includes Aruba, Curaçao and Sint Maarten, will chair the Security Council for one month, March 2018. As of October this year, the Kingdom will be present as an acting member at the meetings. After the election, the Minister was proud of the temporary seat in the main international peace and security body. “Membership is an excellent opportunity for the highest level of influence and issues that are important to us on the agenda,” said the Minister.